When I first learned of Paul Revere’s famous ride is unclear. It could have been 1957 or 1958. After all these years, I recently read that the Massachusetts silversmith, galloping on a borrowed horse named Brown Beauty, might not have said, “The British are coming!” Instead, it was more like, “The Regulars are on the move!” On April 18, 1775, the Regulars were the minutemen’s red-coated adversaries, marching to arrest patriots John Hancock and Samuel Adams. Whatever Paul Revere said put him in America’s history books. 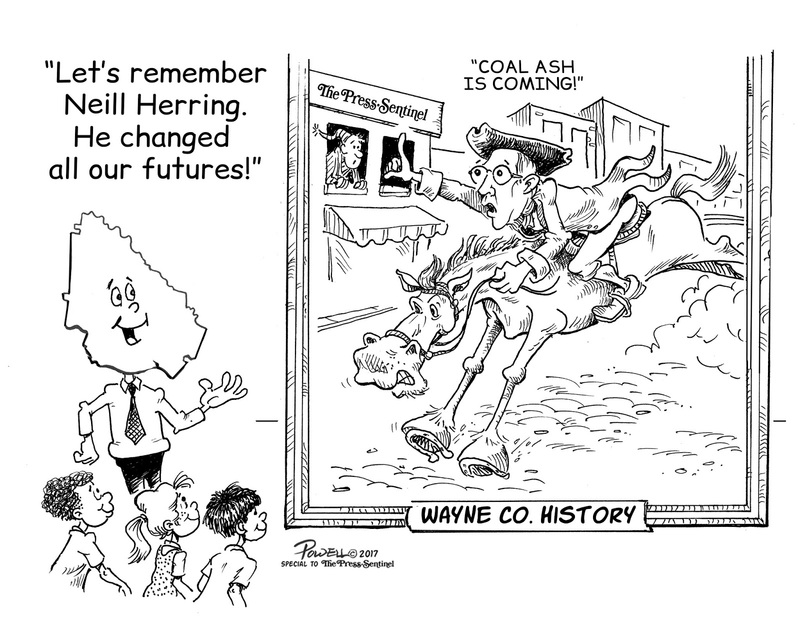 And when Wayne County’s history of our current coal-ash uprising is recorded, Neill Herring will be our modern-day Paul Revere. Our friend hoofed it—afoot—to 252 W. Walnut St. to alert Derby Waters. The Corps had changed its public-notice procedure. The Press-Sentinel wasn’t on the list, but Neill was. Central Virginia Properties LLC had some big plans for Wayne County. That’s exactly what Republic Services Inc. had hoped. Who in Wayne County would pay any attention to an unknown entity such as Central Virginia Properties? The answer is almost no one except Neill Herring. The bespectacled environmental lobbyist is a voracious reader with encyclopedic knowledge of the sausage-making ways of government. Neill knows the value of reading the fine print and asking questions. On Jan. 4, 2016, Central Virginia Properties LLC filed an application with the U.S. Army Corps of Engineers to build a rail spur to service its parent company’s Broadhurst Environmental Landfill. The mystery name didn’t trick Neill. That’s why he went to see Derby at The Press-Sentinel. But why did Republic want these mile-long, wetlands-destroying sets of railroad tracks? The answer was there for the reading. The rail spur was to accommodate up to 100 rail cars per day. And what was going to be in those rail cars? Oh, as much as 10,000 tons of toxic coal ash. Coal ash? 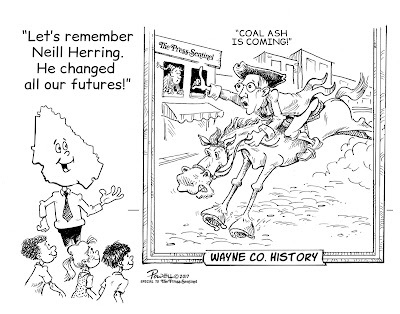 What’s coal ash? Most of us knew as much about coal ash as we did about Central Virginia Properties LLC. With nine days gone in the Corps’ 30-day public-comment period, the race was on to slow this dangerous almost-runaway-train scheme. You know what happened next. The newspaper told you what we learned, and we hired a team of environmental lawyers. A grassroots citizen group was formed to oppose the rail spur and the dumping of poisonous waste in Wayne County. Twice the Corps of Engineers extended the public-comment period. As the public uproar continued, Republic pressed on, confident its 2005 contract had county officials handcuffed and neutered in the fight. And on April 5, 2017, Republic made a surprise “good-neighbor” offer to drop its rail-spur and coal-ash plans and discuss the possibilities of a new, less onerous contract. Cheers erupted. Then, we waited and waited. Several months later, the new proposal surfaced. The good-neighbor plan had a multimillion-dollar price tag dangling from it. Cheers turned into jeers, but we are still hoping Republic will do the right thing. In the meantime, we cannot back down.